Honeyfingers is playing this entire album which is a favorite of ours, and a pedal steel guitar textbook! Willie Nelson was in the band along with Ray’s long time pedal steel player, Buddy Emmons. 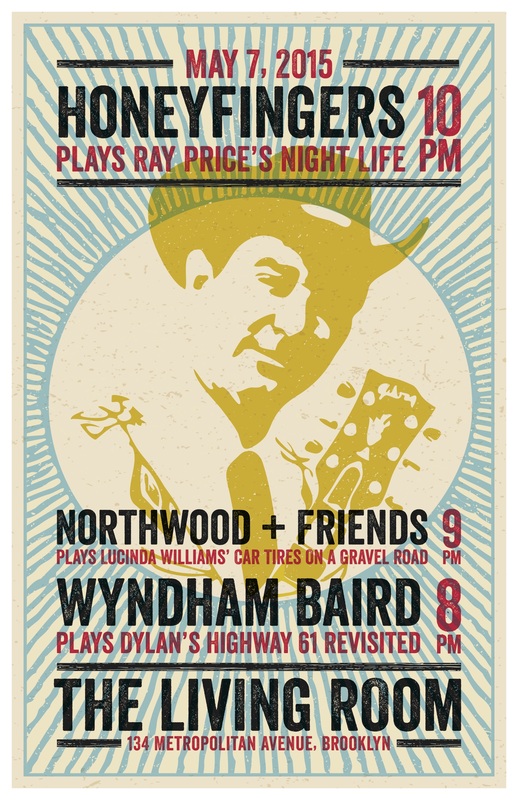 We will be joined by Wyndham Baird who will play Dylans Highway 61 Revisited as well as Northwood and Friends who are playing Lucinda William’s Car Wheels on a Gravel Road. This great poster was designed by our friends over at Revival Letterpress. Show starts at 8pm, looking forward to it. Honeyfingers has been making waves collaborating with singers, Zephaniah O’Hora, Chris Kearney as well as, NYC guitar legend, Jim Campilongo. Zephaniah O’Hora and Honeyfingers recently covered Ray Price’s, Night Life, record from start to finish at 11th street bar. We have some other incredible singers and projects in the works! Stay tuned! This past month we said farewell to, Ray Price, a country giant whose music and bands have influenced my playing so much and are one of the main inspirations for Zephaniah O’Hora and I playing music together. Here is us at one of our Skinny Dennis Tuesday night country residencies paying tribute with him with the song, “A Way To Survive”. Honeyfingers is officially taking up residency on Tuesday nights at Williamsburg Honky Tonk, Skinny Dennis. We are featuring vocalist, Zephaniah O’Hora, who will setup up behind the mic despite his busy schedule as NY’s #1 Snake Oil Salesman along with our usual compliment of Villains; Jonny Lam on pedal steel, Luca Benedetti on Telecaster guitar, Roy Williams on that Gypsy guitar, and Dave Speranza thumping that big bass and special guest drummers. We will be playing classic 50s-60s country repertoire for you to DANCE to. My band, Honeyfingers, has spent the last few months working with NY guitarist, Jim Campilongo, doing arrangements of his tunes for 2 guitars and steel guitar. We are honored to play the last show of his 8 year Living Room residency on October 21st, I think this will be a special night. Here is a song from a gig at Barbés. Honeyfingers has been asked to play Brooklyn movie theater, Nitehawk Cinemas Country Brunchin’ series on September 7th and 8th, and I can’t think of a movie that encapsulates what Honeyfingers is about more than Cityslickers. Billy Crystal and Bruno Kirby go together like a steel guitar and a telecaster. We are really looking forward to this! Showings on Saturday and Sunday. Tickets are available for purchase here.